Shiplyst - Instant ocean freight rates & container shipments online. 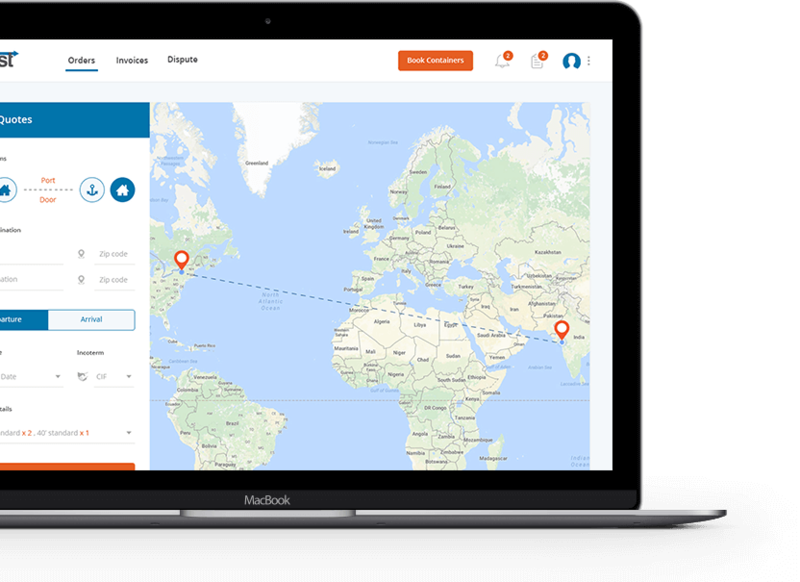 Instantly compare quotes from multiple Freight Forwarders on the go! Now it’s just a click away! Hassle free - End to End Shipment ! Input the shipment requirements. These include details such as Port of Loading, Port of Discharge, Commodity, Inco terms and number of containers including the type and size. You can also mention whether Door pickup or Delivery is required and mention the Zip Code of the pickup or delivery location. 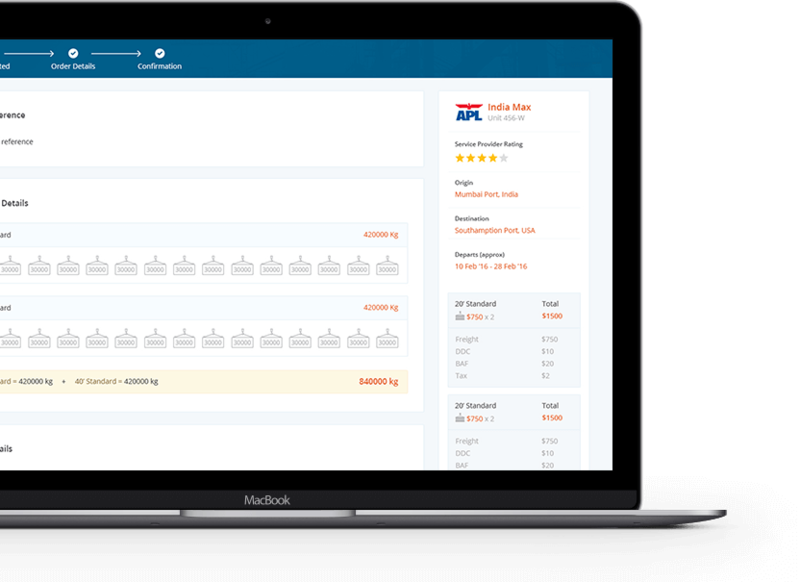 Instantly generate ocean freight quotes from multiple Freight Forwarders. You can see the quotes based on Carrier and Schedules. We also provide details of transshipment, quote breakup including Haulage, Origin and Destination charges. 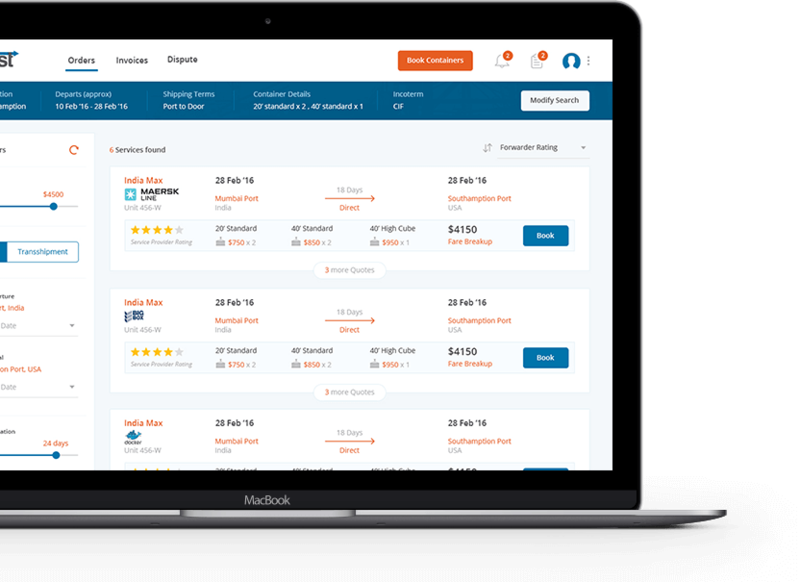 You can filter quotes based on cost, transit time, carrier, and Freight Forwarder rating. Enter the Cargo information such as gross weight, commodity HS Code, Shipper details. Rest of the details can be filled up later once the booking is confirmed. Review the information before submitting and get a confirmation within minutes. No more waiting for hours for booking confirmation. 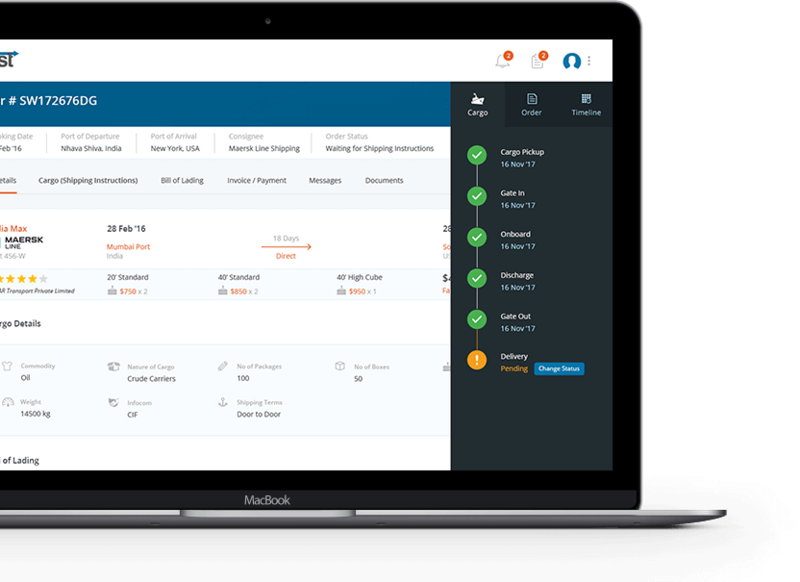 Once your cargo is onboarded, the system will automatically generate your Bill of Lading & Invoice. You can always review the BL before release. Invoices can be paid through various payment options such Credit Card, Bank Transfer. Track your cargo in real time from beautiful dashboard. No more waiting for the Daily shipment reports or calling your Freight Forwarder for cargo status report. The system automatically tracks transshipment connections and alerts you if any exceptions are generated. Search for quotes instantly. No more waiting! No more delays. Track your container in real time anytime, anywhere. No more waiting for a daily status report via email. All data and communication on the marketplace is secured using industrial grade encryption. Choose the best freight forwarders from the industry very single time. We are available to answer all your shipment related queries 24 hours a day, 7 days a week. We are a team of supply chain and technology professionals on a mission to make international logistics simple. We achieve this through innovative tools and cutting edge technology. 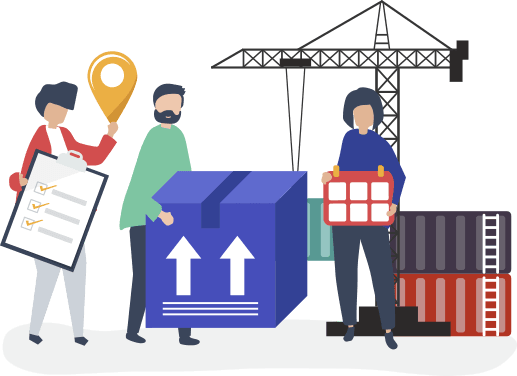 Shiplyst’s advance logistics platform makes container freight simple, transparent, efficient and more cost effective. Please fill in the details below to get started. Our logistics specialist will reach out to you to setup your account and walk you through the entire booking process.